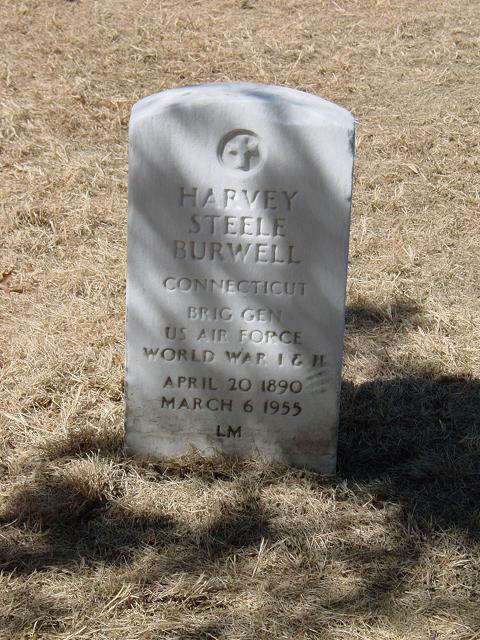 Harvey S. Burwell was born in Winstead, Connecticut, on April 20, 1890. He graduated from Norwich University, Vermont, in 1913 and was commissioned a Second Lieutenant of Cavalry on October 4, 1913. His first assignment was to the 12th Cavalry at El Paso, Texas, and he served with that regiment until January 1916 when he was transferred to the 6th Cavalry at Donna, Texas. Early in 1916 he accompanied the 13th Cavalry into Mexico. In December 1916 he entered the Signal Corps Aviation School at San Diego, California. On July 13, 1917, he was transferred from Cavalry to the Field Artillery. He went to Kelly Field, Texas, in July 1917 as Officer in Charge of Flying, and in March 1918 was transferred to Taliaferro Field, Texas, for a course in Aerial Gunnery. He went to Ellington Field, Texas, in April 1918 for training in bombardment. He became Commanding Officer of Rockwell Field, California, in May 1918. Here he was associated with General Doolittle and many other men who were to make aviation history. In April 1919 he was sent to Love Field, Texas, as Commanding Officer. On July 1, 1920, he was transferred from the Field Artillery to the Air Service. He went to Europe in September 1920 for duty commanding the airfield at Weissenthurm, Germany, returning to the United States in August 1922. He was then assigned to the Office, Chief of Air Service, in Washington, D.C., and in March 1923 went to Kelly Field, Texas, as operations officer of that post. He became Commanding Officer of the 3rd Attack Group there in July 1924. From August to October 1925, he was at Rockwell Field, California, planning gunnery fields for an attack group. He then returned to the Office, Chief of Air Corps, in Washington, D.C., and in April 1926 was assigned to Mitchel Field, New York. He was at McCook Field, Ohio, from July to October 1926, and then went to Bolling Field, D.C., where he became Executive Officer. He returned to McCook Field in December 1926 as Chief of the Special Inspection Section. In March 1927 he was named Commanding Officer of Bolling Field, D.C., and served there until February 1928 when he became Executive Officer of Crissy Field, California. He was designated a Professor of Military Science and Tactics at the University of California in Berkeley in July 1928. In September 1931 he entered the Air Corps Tactical School at Maxwell Field, Alabama, and upon graduation in June 1932, he entered the Command and General Staff School, For Leavenworth, Kansas. He graduated from the two-year course in June 1934 and became Air Officer of the Seventh Corps Area, with headquarters at Omaha, Nebraska. In March 1935 he was assigned as Personnel Officer (G-1) of the General Headquarters Air Force at Langley Field, Virginia, and in October 1935 went to Washington, D.C., as Liaison Officer between the Office, Chief of Air Corps, and General Headquarters Air Force. In April 1937 he was ordered to March Field, California, to command the 19th Bombardment Group. Here he had Captain Colin Kelly as one of his flying officers. The unit later made military history with its operations in the Philippines, Java and Australia. He then went to Wheeler Field, Hawaii, in April 1940 as Commanding Officer, and in November 1940 became Commanding Officer of the 14th Pursuit Wing at Fort Shafter, Hawaii. He was then assigned as Special Inspector of the Hawaiian Air Force in July 1941, with headquarters at Hickam Field. In July 1941 he returned to the United States and was stationed in Washington, D.C., for duty with the War Department General Staff. In December 1941 he was assigned to Headquarters, Army Air Forces, and in April 1942 he assumed command of Lowry Field, Colorado. He went on to command Amarillo Army Air Field, Texas. The general was rated a command pilot and combat observer.